When in 2045 Dr Horatio Lestoq, All Souls Prize fellow and freelance journalist, discovers the corpse of a nonagenarian admiral in very suspicious circumstances - and is wrongfully arrested for murder - he is suddenly flung into a series of dangerous adventures. 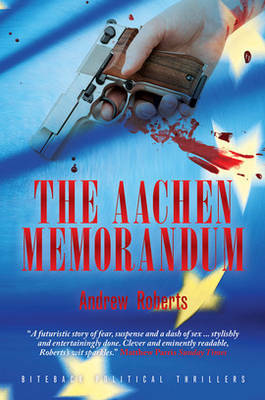 He embarks on a trail of discoveries that lead to a scandal at the heart of the United States of Europe - the corrupt, bureaucratic, xenophobic Euro-superstate that has all but snuffed out British identity. Can the overweight, snobbish, lecherous, asthmatic, cowardly Lestoq stay one step away from his sinister pursuers? Is his lover Cleo Tallboys, the sexiest secret policewoman in Europol, all that she seems? Is it coincidental that Prince William Windsor, King of New Zealand and pretender to ex-King Charles III's former throne, should be visiting Britain just as Lestoq stumbles across the scadal. As body piles upon body, will the dreadful truth emerge of how British independence and sovereignty was extinguished by the now all-powerful USE?